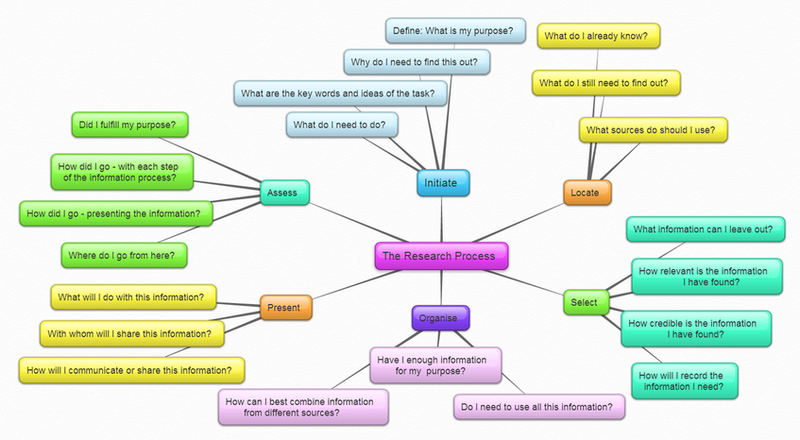 • How can I deconstruct the research topic? • What are the key words and ideas of the task? • What is my Inquiry Question Focus or Thesis? A good inquiry question should include a call to action, be open-ended and align with learning goals (but not specifically stating them). What adaptations do animal species make in order to survive in various habitats? Could a dog live in a desert? How can we use measurement skills and knowledge of geometery to plan a park? How can we plan a good park? K-W-L (Ogle, 1986) is a strategy that can be used to assist students at the Initiate stage of a research process. Students begin by brainstorming everything they KNOW about a topic. This information is recorded in the K column of a K-W-L chart. Students then generate a list of questions about what they WANT to know or need to know for the research topic. These questions are listed in the W column of the chart. During or after the research process students answer the questions that are in the W column. This new information that they have LEARNED is recorded in the L column of the K-W-L chart. Taps into students’ prior knowledge of the topic of the text. Structures the initiate stage of the research process. Helps students determine their research topic. Ogle, D.M. (1986) K-W-L: A teaching model that develops active reading of expository text. Reading Teacher 39, 564-570.